The Edinburgh Dungeon brings together an amazing cast of theatrical actors, special effects, stages, scenes and rides in a truly unique and exciting walkthrough experience that you see, hear, touch, smell and feel. It’s hilarious fun and it’s sometimes a bit scary. The Edinburgh Dungeon is an 80 minute journey through 1000 years of Scotland’s horrible history. Tours leave around 10 minutes apart and guided by a full cast of actors, you and your companions then move from show to show. You will laugh and scream as you encounter gripping storytelling, exciting rides and thrilling special effects. It’s based on real history and legend (minus the boring bits) where you come face-to-face with sinister characters from Scotland’s gruesome past, including murderous twosome Burke and Hare and the Scottish Legend Sawney Bean. Experience the disastrous effects of the plague in Street of Sorrows, the fearsome torture chamber and even a mysterious Boat Ride through the Caves of Galloway. It’s a fully themed experience. That means 360° sets, full on authenticity and theatrical storytelling. On your journey you’ll pass through the Caves of Galloway, plague-ravaged closes, the fearsome torture chamber… and might even get a hanging for your crimes on our Drop Dead ride. Believe us, it’s better than a sightseeing or boring museum tour of Edinburgh. The best way to really experience medieval Edinburgh is to follow your feet – and your guide! We’ll reveal the closes and courtyards; sites and stories to give you a true sense of our past and our people. So we know we have a tour for everyone. 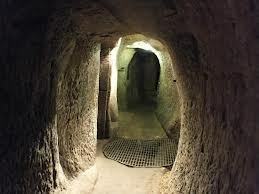 Gilmerton Cove is a series of hand carved passageways and chambers that lie below ground to the south of Gilmerton crossroads. After five years of work by Gilmerton Heritage Trust and The City of Edinburgh Council to restore and preserve it for future generations, it opened in August 2003, providing visitors of all ages with an educational and fun experience. The entrance to Gilmerton Cove is through a visitor centre adapted from a traditional mining cottage. This cottage now houses imaginative audio and visual displays that depict the various theories behind the origins of Gilmerton Cove which, after extensive archaeological and historical research, still remain a mystery. These include theories that it was the unique work of an 18th century local blacksmith George Paterson, a drinking den for gentry, a refuge for persecuted Covenanters and a smugglers lair.